The High 48s make music that combines the soulful sound of classic bluegrass with a modern attitude, original songs and a wide range of influences. Enjoy their lively show on Sat., May 4, at 7:30 p.m. on the Crossings stage. The band takes its name from railroad slang for the boxcars originally used to transport troops on the front lines in WWI that could carry 40 soldiers or 8 horses, and were later used in the US on fast-moving “hot shot” freight trains by train hoppers looking for work during the Great Depression. 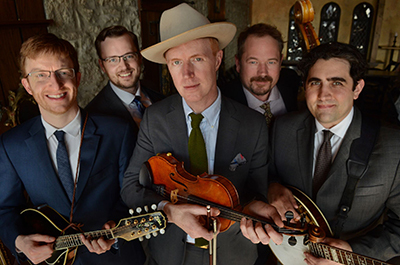 These musicians found a passion for bluegrass after playing rock, alternative country, indie rock, punk and jazz, and they play original songs created from a wide range of influences far beyond Bill Monroe, the Stanley Brothers, and Flatt and Scruggs. Daddy Was a Bank Robber, the band’s eighth album, is their most personal — and present tense — release to date, with original music by the 48s (including two songs from the band’s newest member, Mike Hedding) and a handful of covers that represent a musical snapshot of the band’s (very eclectic) record collections, including songs by alt-rock great Robbie Fulks (Goodbye Virginia), bluegrass maverick John Hartford (Long Hot Summer Days), blues singer/guitarist Little Milton (Let Your Loss Be Your Lesson) and the Clash (Bankrobber).